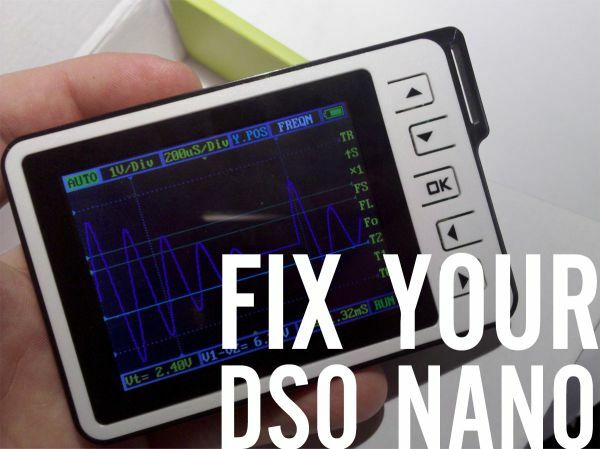 This is my friend Scott’s DSO Nano 2, a pocket oscilloscope manufactured by Seeed Studio. It’s a neat little thing, but has a mess of flaws. 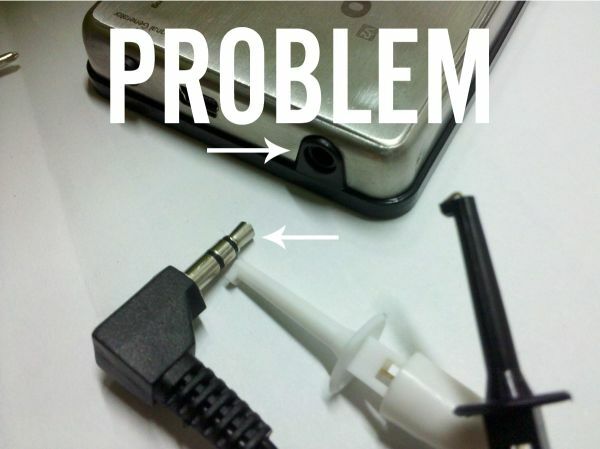 The probes that come with this pocket ‘scope use 3.5mm headphone plugs and jacks. 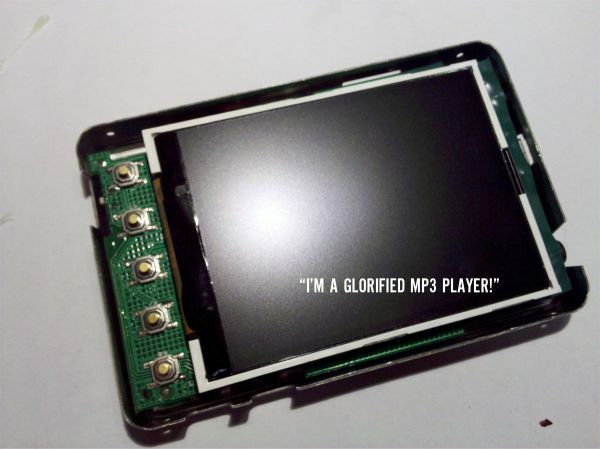 Anyone who has ever owned an MP3 player knows this is going to be trouble, especially if the jacks are not reinforced internally. And they aren’t. Just look at those problems. So you’ve got to crack the thing open. 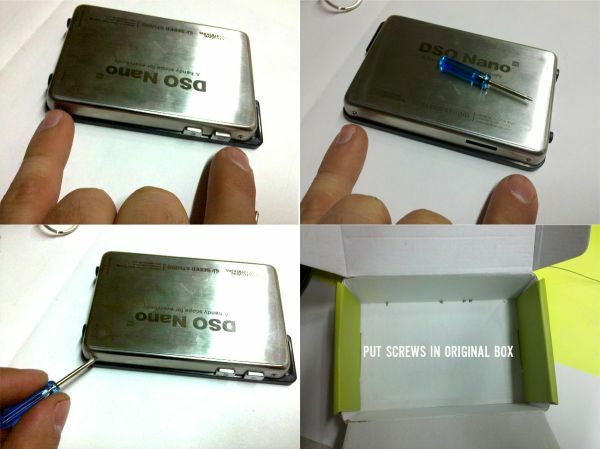 It’s easy, there are only four screws, and they give you a teeny tiny screwdriver. 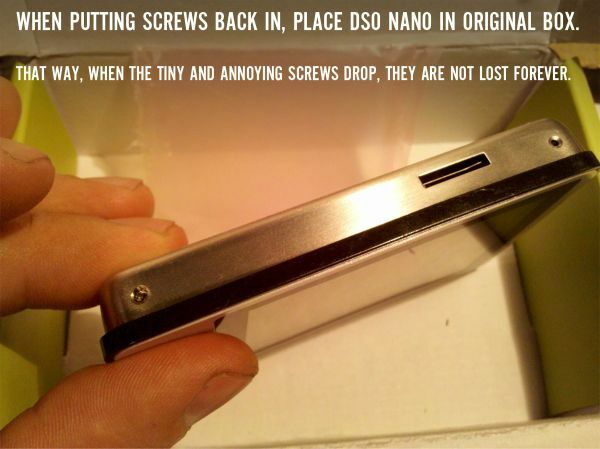 Put all screws in the box that came with the Nano, or stick them to a piece of masking tape. They are small and easy to lose. 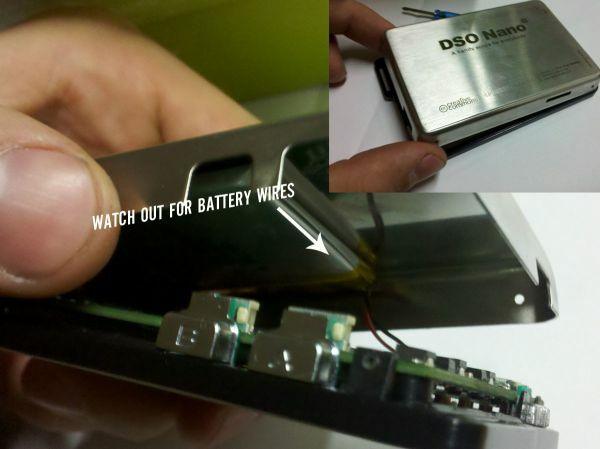 When you open the Nano, be careful of the battery wires, because the battery is taped or glued to the back shell. 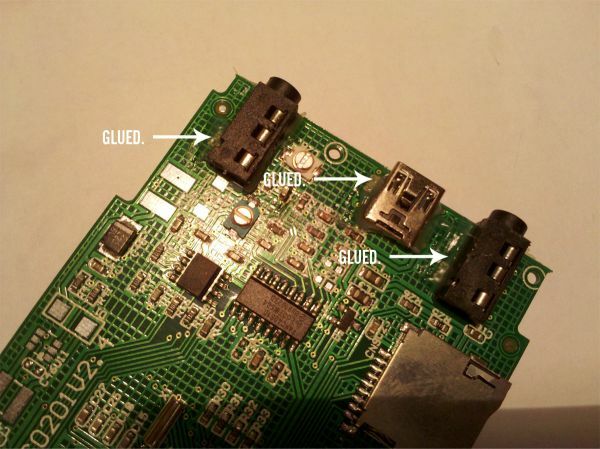 Remove the three screws holding the main circuit board in place. Lift the board. You can see that the display is held in place by foam tape. 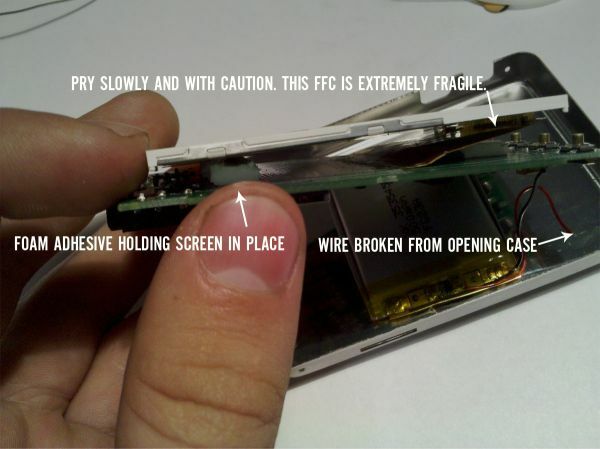 Pry carefully on the display, being extra careful not to disturb the extraordinarily fragile Flat Flexible Connector/Cable on the other side, as it would destroy your LCD. The problem should be immediately obvious. In this case, several solder joints had broken/lifted. 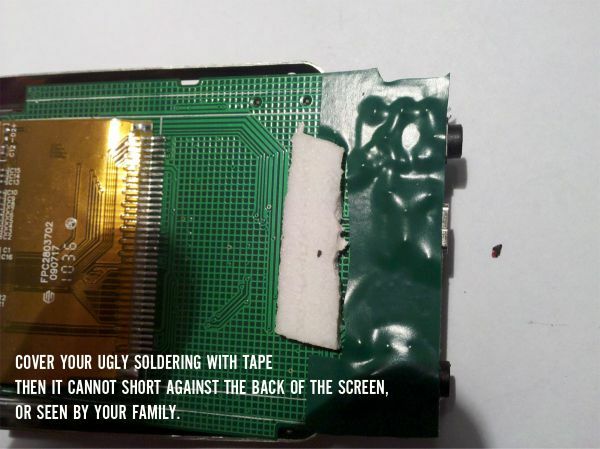 In general, solder should not be relied on for mechanical stability, especially with SMD components and external jacks. We’ll deal with that in a minute. Heat the solder joints, adding a bit of solder to refresh things. 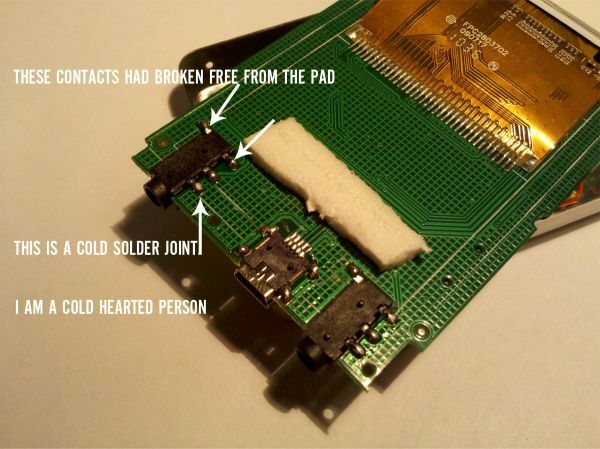 I re-soldered every single contact, to be sure that there were no invisible breaks. Get some glue. 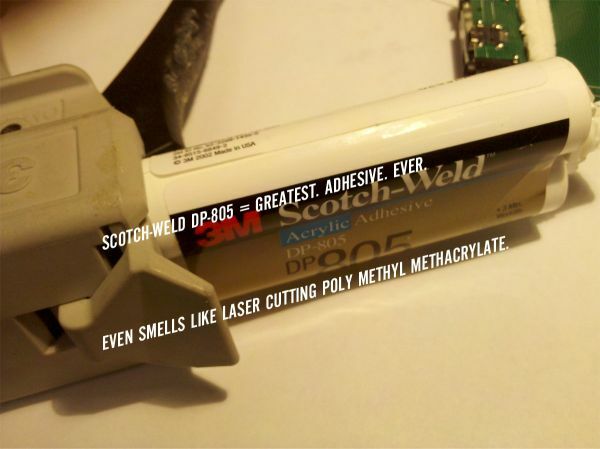 Two part epoxy is good, hot glue is OK, but Scotch DP805 is a masterwork of modern chemistry. Highly recommended. Apply glue to the jack. Keep the glue thin. 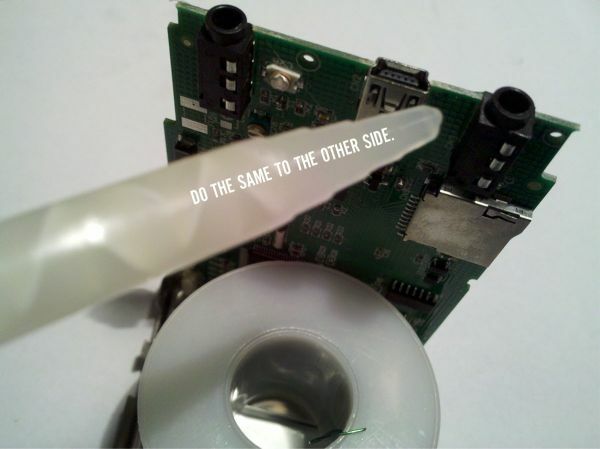 Don’t let it get inside the jack – apply to the sealed side first, and then to the contact side, but not on the contacts (if they break again, you’ll want them clean for soldering). Now don’t slack. Do the same to the other side of the jack for maximum stability. Glued? Yes, including the mini-USB port. Now to deal with the battery issue. Strip the wire. Since I didn’t want to pull on the wire, I used the heat of the soldering iron to move the insulation back. Not recommended in general, but worked fine here. 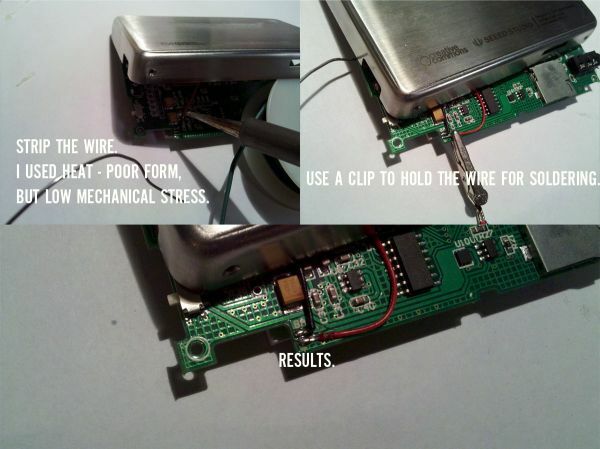 Then use an alligator clip to secure things for soldering. 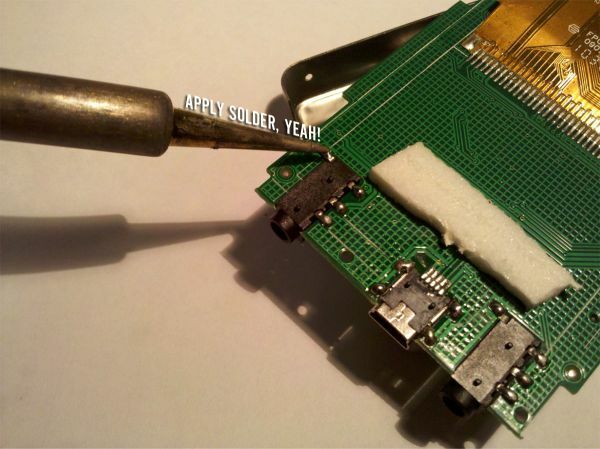 Solder. Tape over all that ugliness. For, uhh, safety. 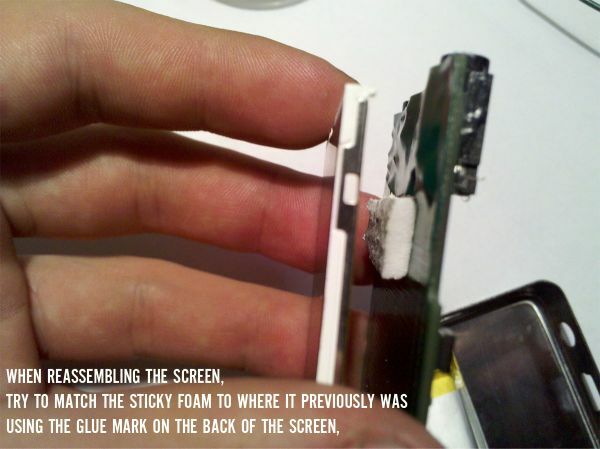 Try to put the screen back on the adhesive exactly as it was. 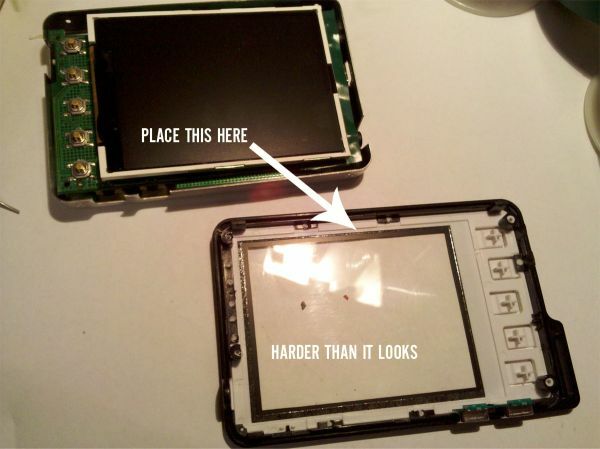 Place the screen back into the front of the Nano. It’s tough – the screen does have a slightly depressed area to fit into. You may have to place it a few times to get it right. I had to use the mini-screwdriver to shove it in place. I also made the mistake of leaving the power switch on when fixing it. Dangerous stuff. Turn it off. Don’t lose the little plastic bit that covers the switch. 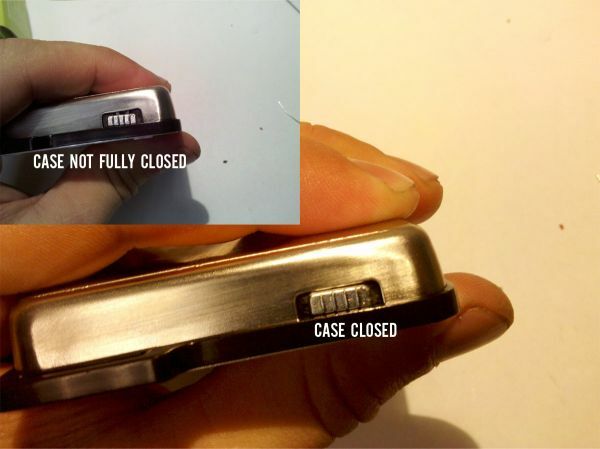 The metal part of the case is designed to press into a slot on the front cover. If it’s not in the slot, things won’t look right. Press carefully around the edge of the device to get the whole thing in bit by bit. You’ll be able to see when it is fully closed. Put the motherboard screws back in. Now you’re ready to put the tiny side screws in. Don’t lose them. Put the Nano in its box so that when these things inevitably fall out, they are contained and easy to find. Enjoy your fully functional baby scope. Even though I don’t have a DSO Nano, I must say that this is one of the most well-written, well-documented, and well-humored tutorials I’ve ever seen. Thanks, Jared! Glad to hear you liked it. Great tutorial! Now I know what to watch for when I do this to my DSO. Weekend here we come! This makes me think about getting one. Glad You were so Detailed. I look forward to seeing more of your Blog/site posts in the future. Great tutorial. If/when I finally break mine, I’ll be dropping by to tweak it and get those leads fixed. I know how hard it is to do step by step teardowns well, thanks for catching all of the details. Cool, my DSO was acting up and would only play nice when held a very certain way. when i pulled it apart i could see the 3.5mm socket was so loose. not good design, thanks for the tip re: glue, i used epoxy and now i hope it works as new again. Ouch. 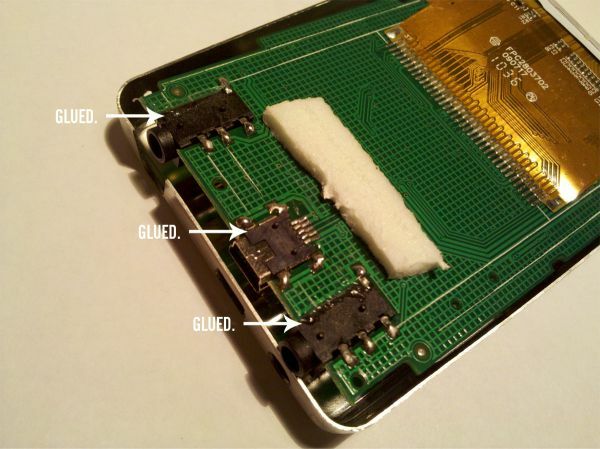 I think the board is a 3 or 4 layer, and the pads connect to an internal layer. Cannot be repaired but luckily Polish distributor exchange on the fly and reinforces under request for free. 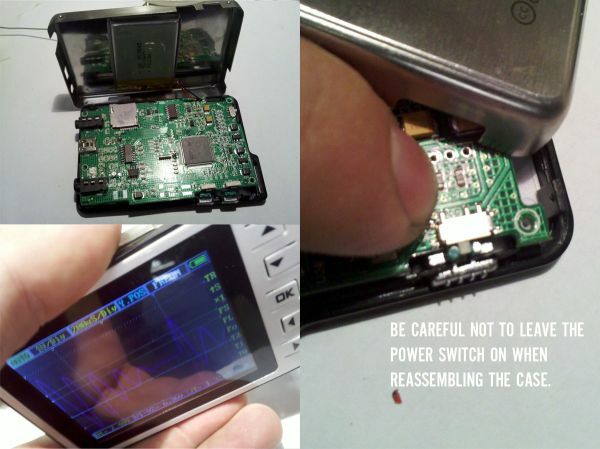 Tell your friend to get the Benf 3.64 firmware for the Nano, and he will have a truly useful tool. Go to the SeedStudio site, and look in the Nano forum, and you can find out how. West System is cheaper than 3M DP805, just slower. Nicely done, Patrik. Glad this was of any use. Nice work! Connectors should be part of the device it’s case with wires connecting to the PCB. I also reinforced te connectors of my tablet with glue and other components tot avoid wearing. do you have layout diagrams and schematics for this model. find docs for this model anymore, as it’s not the current one. 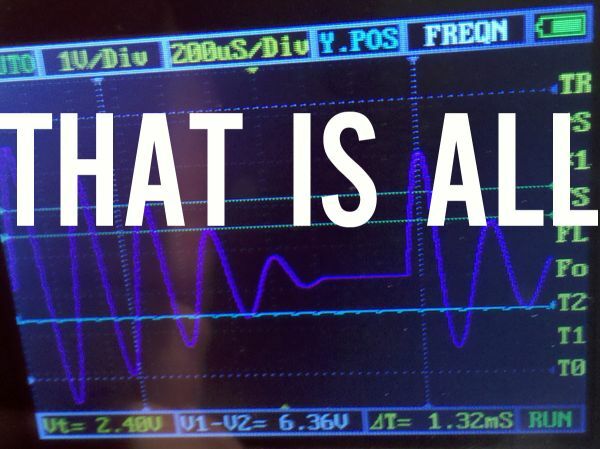 was the input resistor, and this turned out to be true.